Japan's trade deficit widened in September. This makes three deficits in a row and four deficits in the past five months. Japan's trade situation is not helping to support domestic growth. Exports are up by 1.2% over 12 months and are falling at a 4.9% pace over three months. Imports are up by a strong 9.2% over 12 months and at an even stronger 13.6% annual rate over three months. From 12-months to six-months to three-months, the yen has risen on a broad-yen valuation basis by 0.7%. Over that same period, the yen has fallen at a very slow pace vs. the dollar. It is down over 12 months by 1.2% vs. the dollar. Separate data on export and import prices allow us to see what is going on below the surface of the nominal flows. Real exports are falling by only 1% over 12 months but falling at a 10.5% annual rate over three months. Nominal imports are up strongly but real imports are off by 1.6% over 12 months then rising at a 1.4% annual rate over three months. Trade volume trends show a little less of a drag on growth over 12 months than on a nominal basis. But over three months, the real flows are deteriorating sharply as export volumes fall and import volumes rise. Prices show the impact of rising oil over 12 months as import prices are up at a double-digit pace over each of the sequential segments: 12-months, six-months and three-months. Export prices are trendless, but they are rising faster over six months and over three months than they are over 12 months where the gain is just at a 2.3% pace. The terms of trade (ratio of export to import prices) are deteriorating indicating a faster rise in import prices than in export prices; it is taking more exports to buy the same amount of imports. Prior to the recent run of deficits, Japan had a string of surpluses for just under 30 months. But over the last five months, Japan is suddenly back in the deficit soup. The exchange rare has not been a big part of Japan's evolving trade situation. Oil prices and weakened growth in markets abroad have become issues. 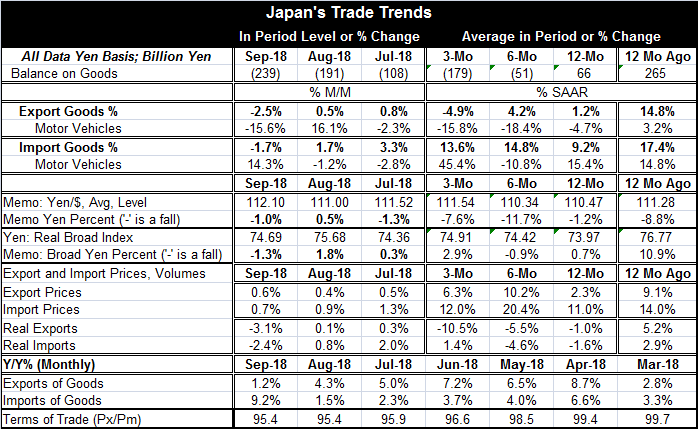 Trade wars, however, could become a much bigger factor since Japan trades the most with China and the second most with the United States. Japan's economy has been rocked by natural disasters from which it still has not recovered going back to the earthquakes and Tsunami. In the wake of those events, Japan shuttered its nuclear reactors and has been importing oil at a time that oil prices have been rising. In early 2018 of 39 operable reactors in Japan, only 9 reactors in five power plants are operating. In 2011, the number of power plants had been put at 54. In the wake of natural disasters, Japan has been reconsidering which plants are safe and viable. Currently, another 5 plants have been approved for restart and 12 more restart applications are under review. Recommissioning nuclear power plants could go a long way to restoring Japan's trade surplus and reducing its dependence on currently expensive oil. Japan continues to try to get growth in gear in an economy with a shrinking population in addition to those other challenges. Inflation in Japan continues to run below the BOJ target and only shows life when oil prices perk up. For now and in the foreseeable future, Japan will continue to struggle to improve growth. It faces a lot of headwinds despite the best efforts of the Bank of Japan. The early reports on Q3 GDP are beginning to emerge. The U.S. reported first and issued a report that was strong by recent standards but with flaws. Today France reported a speed up in growth to a pace of 1.7% from 0.7% previously. But Italy's GDP barely budges, rising at a 0.1% pace in Q3. Belgian GDP was slightly stronger at a 1.6% pace. For all of the EMU, the reported GDP gain slipped to a pace of just 0.6%, down sharply from 1.8% previously. These all are compounded quarterly rates of growth for GDP. The table also presents four quarters of year-over-year growth for each entry in the table. It shows that only the U.S. has GDP growth accelerating year-over-year in each of the last four quarters. Both Italy and the EMU show decelerations in each of the last four quarters. Despite its quarterly acceleration, France shows its GDP growth rate has decelerated in each of the three most recent GDP results for year-on-year growth. Belgium shows a mixed pattern. The table also presents each country or area's growth rate ranked on year-over-year growth results since 1997. On this basis, EMU growth is below its median. Italy's growth is barely above its median. Belgium and France rank in their 58th and 55th percentiles, respectively; neither is particularly impressive. Only the U.S. puts up strong growth numbers. Year-over-year U.S. growth has been higher over this period back to 1997, only 13% of the time. Japan's trade results reflect the sort of weak growth we see being reported in Europe. It is an important reason why Japan's real and nominal exports are weak. The U.S. and China are still positioning over trade and both seem to be settling in for a long conflict. I don't know if China has thought about this, but consumers can switch and find other things to buy. But producers produce what they produce. If consumers in the U.S. are faced with higher prices on Chinese-made goods, they may switch to goods made elsewhere or defer purchases and wait out the trade war or simply switch their expenditures to other goods or to services. But producers need to generate output and to have sales to sustain their labor force. If the trade war drags on, it will be bad for growth everywhere, but it could hit China and Japan especially hard.